Yesterday, of course, Gabriel and I went to go see Coraline... .... .... stunnibabooming! Every marvelousticalur minute, every sensationallic second, every wholly fantastically incrediculous frame. In layman's terms: I loved it! It puts Ptown on the map! Woot! Gabriel works for LAIKA! Wootie Woot! It's CG, and first film ever filmed in TRUE 3D! Whoooooooot! This film inspired me. Travis Knight, started at the pre-LAIKA studio, Will Vinton Studios, as a wrangler and through his personal drive and motivation he taught himself animation at night. He worked phenomenally hard and worked his way up. He didn't use his famous Phil's spoils and glutinously abuse every sector of the business world, he simply relied on his talent and his ambition. Travis is a perfect example of what has made America so prosperous; creating your own opportunity, fabricating and fulfilling your own destiny, pushing your own limits and determining what your own talents and ambitions are. These are principles we should protect as much as our homes, our families, our money!, our reputations, and never settle for what someone else tells us is "right". I was watching a politically charged show at my parents house the other evening, screaming at the television, and my dad said to me: "You are so opinionated!" I responded: "You better be thrilled for that, or I'd be just another gullible clone nodding my head in unison." Granted, Travis did eventually accept Daddy's money and prestige, but Phil taught Travis, before anything else, the benefit of hard work and self reliance. That is to be admired. My only problem with the movie, and this is altered from the book, is that there is an underlying hinting throughout, that perhaps Coraline is only imagining her alternate world. This is my basic aversion to so many forms of children's media; the repetitious theme of the dream life. It's crushing! It's the ultimate denial of creativity and questioning; the inability to completely allow the viewer to encapsulate themselves in an pseudo world and succumb entirely to its reality. The real world is always out there, pressing in on us, suffocating us with its pervasive existence of political correctness and debt and responsibility! I should like to escape - and not question if it was just a dream. So, like I said: This film inspired me. This film inspired me to want to finish a quilt I started 6 1/2 years ago, and haven't looked at since. It inspired me to not be afraid to write my super secret special and totally going to be a best seller, book. 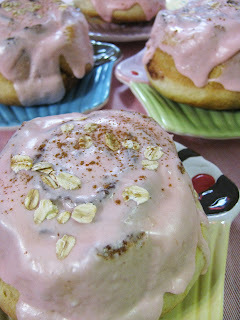 And... it inspired me to make more warm buns with pink frosting. Who can resist? As we discussed before, take your favorite sweet bread recipe because I'm not divulging mine, and roll out to 1/4 inch. 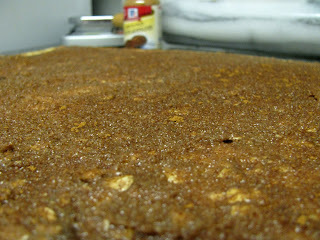 Spread filling liberally over dough, sprinkle with a little more cinnamon, and roll up tight. Cut equal sized circular whirlpools, and press into liberally greased pans (I use a mixture of oil and butter with a pastry brush). Allow to rise. 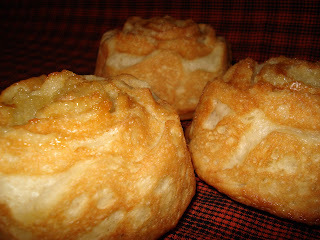 Bake at 350° for 9-12 minutes for cupcake sized rolls, 19-22 for beautiful roses. Immediately remove from pans and while still warm, coat with frosting and allow to melt into buns. I don't know when it happened, but I seem to believe that cinnamon rolls are not complete without oatmeal... so, not only should you add oatmeal to your filling, but once frosted, sprinkle with a few more flakes and a pinch of cinnamon! As I mentioned in Warm Buns, this original recipe, and my favorite version, was created by my Bammieroo with an orange marmalade filling. Is it really appropriate it for small kids or too scary with the whole sew buttons over your eyes idea? concerned mom wants to know! oh my gosh! you are amazing! those oatmeal sticky buns look AMAZING! no way! those are crazy! crazy! crazy amazing!!! you rock girl! you do!!! i am sorry! you just DO! Definitely not too scary for Jack, and I think Tommy would be ok, but that is just my opinion. The parental reviews I've read say any child over 5 would be fine - it's no more "scary" than The Nightmare Before Christmas... 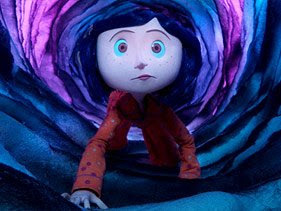 I didn't find it scary at all - Coraline is a true heroine and the emphasis of the movie is her triumph!